Retailers in general are re-thinking many of their commercial practices. Location planning departments will be at the head of the queue when it comes to looking for new answers. Scratching their heads for an alternative strategic approach to where and why they open and close stores. Traditional traffic analysis and demographic profiling should still be the bedrock of decision making. Locations that have the highest active number of target customers will be the most successful. Store concept modelling is also logically based. Commercialising a generic offer, a profitable store model. Evolving this into a store grading and clustering system that extracts the maximum sales and profit from common location scenarios. The location strategy is literally built on the assumption that the customer needs your retail box. Build a box and customers will visit it. The perpetual answer is to open boxes where you are needed and close them where you are not, in the unlikely event this could happen. Improvements to your retail box in terms of its assortment, its design and the creation of experiences will improve its chances of commercial success. However in the current omnichannel climate these may be temporary respites. Part of a losing battle in the war to win a bigger share of a smaller market. The number of commercially viable locations is diminishing. Cash-cows are losing their fat whilst the viability of any previously healthy store can no longer be guaranteed. With the customer no longer needing the retail box, but the box needing the customer. Generic location planning ironically has nowhere to go. The solution for location planning is a change in mind-set. Not what is in the retail box…but what lies outside it! 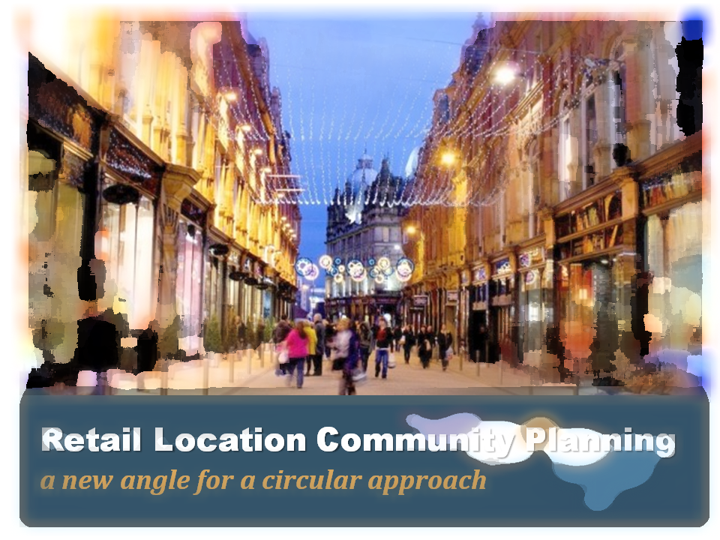 Retail location strategy must analyse store locations for opportunities to interact and integrate with the local communities. To identify where and how the retail box can generate customer loyalty and patronage. Location analysis cannot stop at faceless quantitative statistics, but include and embrace qualitative assessments of behaviour. Transforming numbers into people. Ask not what communities can do for your box, but what your box can do for communities! The opportunities are many and varied. They range from sponsoring local roundabouts to protecting the local environment, supporting local charities and schools to collaborating with social groups, colleges and sports teams, and from lobbying local MPs to actively engaging with local business groups. Recent examples include White Stuff using excess store space for the benefit of the community. An example from Edinburgh, creating gallery space and engaging with local art colleges on student exhibitions. Brands such as Timberland have sponsored and collaborated on restoring city centre footpaths and abandoned rights of way in the neighbourhoods where they are present. REI has become a destination for organising a multitude of staff and customer outdoor activities and environmental projects. The Sperry deck shoe brand now famous for organising and managing beech cleaning mornings. Examples are many and encouragingly they are growing. Consider a Retail Liaison Manager assessing existing and new store locations for needs and opportunities in community services and social activities – evolving and managing resources and ideas. Imagine, as standard, a statistical analysis of community opportunities in every location planning proposal landing on the Commercial Directors desk. As a priority KPI for store managers and regional managers, evidence of activities and initiatives in the local community. Multiples, in particular, are losing contact with the locations where they have stores. The monotony of corporate greyness is overshadowing the benefits of the multiple retailer proposition. Sales and profits are declining. The way out is to engage with customers and their communities. To evolve a personal touch from a multiple mentality. And whilst the front-line of engagement will be the local store personnel interacting with their friends and community, there is a significant requirement for corporate support – beginning with the location strategy team. Retail locations and the footfall to each are continuing to diminish. The promise for innovative retailers such as White Stuff at the forefront of applying new location strategies is to win a larger share of what remains. The potential reward of widespread changes to location strategy thinking in the retail industry is to turn back some of the tide of downward footfall trends. That must be a good thing – not only for retailers, but for town centres, communities and individual customers everywhere. How are your stores integrating with the communities they serve? Do you consider the full range of opportunities in your location strategy analysis?